It’s more than just a little habit. If you child is a thumb-sucker, he or she could experience real dental problems later on as a result. 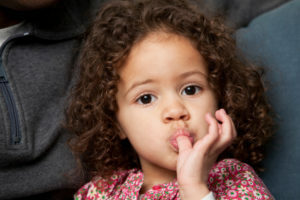 Help protect your little one’s oral health by educating yourself on why thumb-sucking occurs, and what you can do to prevent it. Dr. Rohner and the whole pediatric team in Birmingham, AL are here with more information to help your child enjoy a healthy, beautiful smile — now, and for years to come. Sucking is a natural movement in very young children. It’s one of the first things they master, and how they receive the most basic comfort: food. So it’s no surprise that they start to associate the movement with safety — and they may use pacifiers, their fingers or thumbs to find this comfort, even after they’re eating solid foods. Before permanent teeth erupt, thumb-sucking presents no problems. But if the habit persists beyond the age of three or four, real oral issues can occur as a result, mainly with the proper growth of the mouth and alignment of the teeth. You can help your child stop this habit by keeping a few simple things in mind. For instance, children often turn to thumb-sucking in moments of anxiety, like being separated from their parents — so you can work on helping them overcome the insecurity instead of sucking. They’ll feel the need to do it less when you provide the comfort they’re seeking, instead. When thumb-sucking becomes a real problem, please remember that you and your child can always visit the pediatric dentist in Birmingham, Dr. Angelica Rohner. She and her team are here to make sure your little one’s smile stays strong during childhood, putting them on the road to a lifetime of healthy teeth. We treat each child like they’re our own — so contact us to book your child’s dental appointment in Birmingham today.